The science which treats of the brain, its structure and functions. 1. A physician who specializes in the diagnosis and treatment of conditions affecting the endocrine system. 2. A medically qualified specialist in internal medicine who has subspecialised in the diseases of glandular organs. 1. The branch of biology dealing with the endocrine glands and their secretions; especially, in relation to their processes or functions. 2. The study of hormones, their receptors, the intracellular signalling pathways they invoke, and the diseases and conditions associated with them. 1. The study of puzzles and being involved in their creation and construction: Will Shortz is said to be the only man who has the world's only college degree in enigmatology or the art and science of puzzles; including, word puzzles, math puzzles, and logic puzzles. Will Shortz is the senior editor of Games magazine and puzzlemeister on National Public Radio's "Weekend Edition". At Indiana University, he became the first and only person to major in puzzles and, in 1974, to receive a degree in enigmatology. 2. The system of making riddles or the skills used in solving them: Enigmatology involves the investigation of, or the science of, puzzle creations and their solutions. By the age of 15, Shortz was already writing a puzzle book, and selling his work to national magazines. His fascination with puzzles continued into college where, through the independent learning program at the University of Indiana, he created his own college curriculum in enigmalology. "The people at IU were pretty skeptical at first," Shortz said, "but they came around." Shortz was able to find professors who were willing to work with him on courses of his own devising, in various disciplines, all related to puzzles. He obtained his degree in 1974, after completing courses such as "Creation of Mathematical Puzzles", "Word Puzzles in the 20th Century", and "The Psychology of Puzzles". His thesis, on "American word puzzles before 1860", was published in a national journal of recreational linguistics. In addition to his puzzle constructions and solutions, Shortz has also established a collection of puzzle-related books and magazines. He is said to have over 3,000 of them, dating back to the 18th century. Puzzles "appeal to my mind," Shortz said, in describing why his childhood hobby became the focus of his life. "I love to think and exercise my brain. Puzzles are very satisfying because they take you into almost every other field of endeavor, and you learn something about history, art, music, or any subject you can think of." 1980; pages 323 and 324. An account of the intestinal glands. Someone who specializes in the study of insects: Ever since he was a little boy, Lorne has loved to watch butterflies, so he decided to become an entomologist in order to learn more about such small creatures, like ants, beetles, and flies. © ALL rights are reserved. 1. The branch of zoology that deals with the study of insects: The biology teacher brought in a book about entomology so the students could identify the bug that they found in their classroom. 2. Etymology: from French entomologie (1764), coined from Greek entomon, "insect" + logia, "study of". Entomon is the neuter form of entomos, "having a notch or cut (at the waist)"; so called by Aristotle in reference to the segmented division of insect bodies. 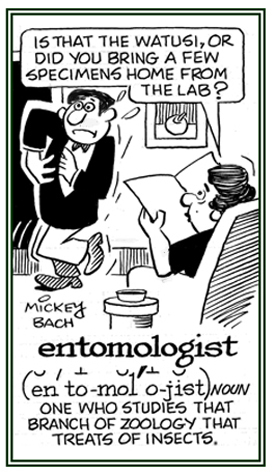 Scientists who study insects (there are close to a million that can be studied) are called entomologists. 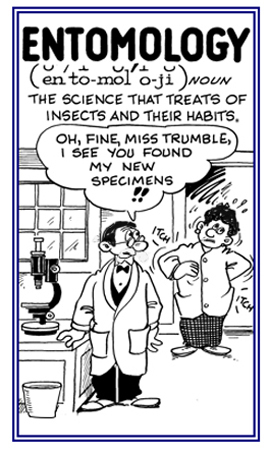 Then why aren't they called "insectologists"? Well, they are. The word insect comes from the Latin word insectum, meaning "cut up" or "divided into segments". The plural of insectum, namely insecta, is used by scientists as the name of the taxonomic class that insects belong to. This Latin word was created in order to translate the Greek word for "insect", which is entomon and literally means "cut up" or "divided into segments", and it is the source of the word entomology. The Greeks coined this term for insects because of the division of insect bodies into three segments, now called the head, thorax, and abdomen. —Based on information from a presentation in The American Heritage Science Dictionary, Houghton Mifflin Company; Boston; 2005. 1. The branch of chemistry concerned with the properties and actions of enzymes. 2. The study of enzymes and enzymatic actions. 3. The branch of science that deals with the biochemical nature and activity of enzymes. The study of the morphological and other changes incidental to puberty. A specialist in the medical study of causes and transmissions of diseases among people. 1. The scientific and medical study of the causes and transmission of disease within a population: Epidemiology is the study and analysis of the patterns, causes, and effects of health and disease conditions in certain populations. 2. The origin and development characteristics of a particular disease. Showing page 24 out of 80 pages of 1193 main-word entries or main-word-entry groups.